Most municipalities in cold weather climates across the U.S. have snow removal ordinances. If homeowners fail to remove snow and ice from their sidewalks in a timely manner, citations / fines are often the result, adding insult to injury. Here are some examples of just a few snow removal ordinances from cities across the U.S. According to Philadelphia Code 10-720, “The owner, agent and tenants of any building or premises shall clear a path of not less than 30 inches in width on all sidewalks abutting the building or premises within 6 hours after the snow has ceased to fall.” Failure to comply in Philadelphia sidewalk snow removal could result in penalties ranging from $100 to $300, and residents can also be penalized for dumping the snow from their sidewalks into the street. The New Jersey “Snow Removal Bill” penalizes the owner or controller of a parking area for failing to remove snow, ice or other obstacles from accessible parking spaces, curb cuts and other improvements designed to provide accessibility. Ice or snow must be removed from the parking space, curb cut or other improvement within 48 hours after snow has stopped falling. A violator of this provision would be subject to a penalty of not less than $200 or more than $500. According to the Municipal Code of Chicago (4-4-310 & 10-8-180), property owners and occupants are responsible for keeping sidewalks clear of snow and ice. Following the severe winter storms of 2009-10 (a.k.a. Snowmageddon), many business owners, property managers and homeowners started exploring the options of radiant heat. Radiant snow melting systems are fully automated and can dramatically enhance safety as well as increase property values. Radiant heated driveways and sidewalks not only eliminate the time consuming task of physical snow removal, but also eliminate the need for harsh snow melting chemicals that can damage surrounding grass and vegetation. Electric snow melting systems are maintenance free. The automated system is activated by a high-tech snow sensor that detects temperatures and precipitation. When the sensor detects moisture and temperatures are below a set point (usually 39° Fahrenheit), it signals the snow melting system’s master control unit. The controller then sends power to the embedded heat cable to warm the driveway as the first snowflake hits. 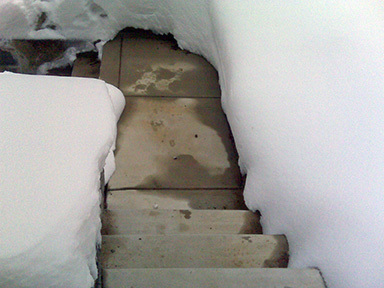 Installing a radiant snow melting system is one sure way to protect yourself from personal injury liabilities and fines from failing to comply with local snow removal ordinances. For more information about automated snow melting systems, contact Warmzone at 888.488.9276. Got Questions About Radiant Heat? The average operational cost for a snow melting system is approximately $0.28 per 100 square feet per hour. This figure is based on a system producing 35 watts/sq. ft. with a kwh rate of $0.08 per hour (the national average kwh is $.08/hour). If you know the square feet of the area you want to heat and your kwh rate, you can calculate the operational costs with this formula: heatable sq. ft. times watts/sq. ft., divided by 1000, times your kwh rate. Click here for more driveway heating information. Q. Are your snow melting systems manually or automatically activated? Warmzone systems come standard with an aerial-mounted, automatic snow switch and a 4-hour manual timer. The system automatically turns on when the temperature is below a set point (usually set at 38° or 39°F) and there is moisture on the sensor. Pavement-mounted snow sensors are also available. Q. In what types of surfaces can your systems be installed? Warmzone snowmelt systems can be installed in almost any surface, including concrete, stamped concrete, asphalt, and under pavers. View our snow melting project gallery. Warmzone systems come with the cold leads pre-spliced and should never be cut or spliced together. If you have questions during installation please consult the installation manual or contact us for assistance. Q. Can the cold leads be cut or spliced together? Cold leads can be trimmed if there is excess cable, but they should never be spliced to other cold leads or cable. Q. Does Warmzone provide detailed layouts for purchased systems? Radiant heat is thought by many to be a fairly new technology that is just now beginning to take hold in Northern America. While radiant heat was initially more widely used in Europe, it is rapidly being adopted by businesses and homeowners throughout the U.S. and Canada. But did you know that radiant heat technology was actually being used as early as 10,000 B.C. in China? The ancient Chinese drafted smoke from fires through stone covered trenches in the floors of their subterranean dwellings. The hot smoke heated the floor stones, radiating warmth into their living spaces. Evidence of radiant heated floors based on this principle were found throughout China and Korea. 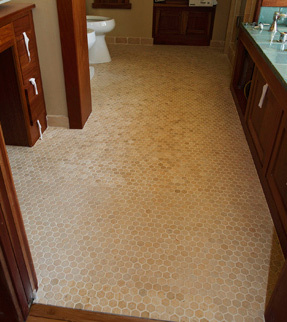 Radiant floor heating was also utilized by the Greeks and Romans as early as 500 B.C. Efficiency: Radiant heat is a remarkably efficient form of heating. Compared to furnaces and other methods of heating, radiant heat requires significantly less operating time to maintain the desired warmth, keeping your costs to a minimum. High efficiency boilers (for hydronic systems) or electric radiant floor heating systems make radiant heat one of your most efficient ways to heat your home. Coupled with a well insulated home, radiant heating systems can quickly warm your home, and each room can be operated independently, further adding to the efficiency of the system. Luxurious Comfort: Similar to the rays of the sun, radiant heat warms objects rather than air to create a more even heat throughout your home. Starting with the floor, objects are warmed giving your home a more inviting feeling as your furniture and other fixtures lose their chill. Custom Design: Radiant heat systems can be easily customized to suit your specific needs. From small floor heating projects to large snow melting applications, radiant heating systems can be designed to heat just about any shape, space or surface type. Clean, Quite Operation: Radiant floor heating systems inherently offer a superior living environment compared to conventional forced air. Since there are no furnaces or blowers, the system operates silently and dust and allergens are not blown through the air, keeping your home cleaner and more peaceful. For those who are especially susceptible to allergies or respiratory ailments, radiant heat has proven to offer significant health benefits. To learn more about the benefits of radiant heat, contact a Warmzone representative and see what options are best for you. Call 888.488.9276 today. Submit your project information and receive a FREE radiant heat quote. Radiant snow melting systems are fully automated so you can stay inside where it’s warm and enjoy your coffee or hot chocolate as you watch the snow melt as it hits your driveway. An automatic snow sensor signals the snowmelt system’s controller when precipitation is detected and temperatures are below 39° Fahrenheit. The controller then sends power to the embedded heat cable, rapidly warming the driveway and keeping it clear of snow and ice. The system shuts off automatically after the storm. Electric radiant snow melting systems have an extremely fast response time, operate silently, and are maintenance free – and there are several options to choose from when considering a radiant snow melting system. There’s really no better, or easier way to keep your driveway clear of snow and ice during the winter than with a radiant heated snow melting system. The peace of mind that comes with making a smart purchase is invaluable right now. We are all looking for ways to ride out this recession and worrisome economic climate, but you can still enjoy some of the finer things in life, and invest wisely in products that will benefit you for years to come.